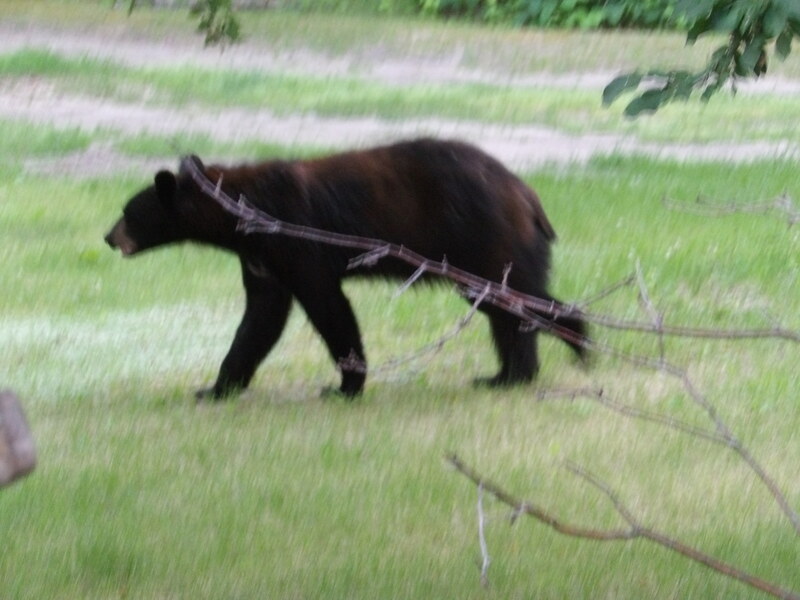 The first week in May I happened to look out my kitchen window and saw a small bear cub in my yard. Because of its size I immediately started looking for the mother but she was no where in sight. 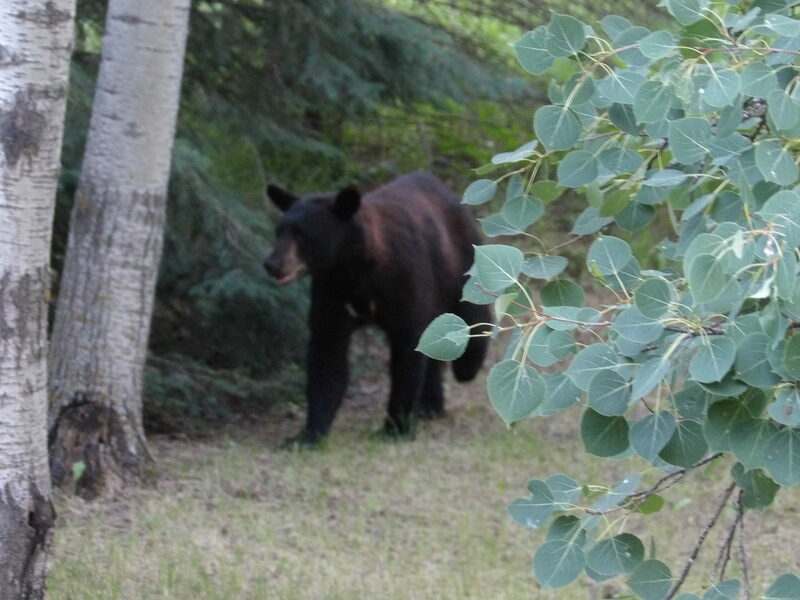 Not wishing to meet the mother, I stayed inside and the bear cub wandered off into my woods. A couple of days later the same scene played out but this time I had two small bear cubs. When I say small I mean they were far to small to be out and about without their mother. The third time this guy showed up I felt safe in venturing out into the yard and obtained the above photo. He was obviously alone, looked thin, hungry, and looking for help. This photo of the pathetic little orphan makes it obvious it needs help. I went to the house for a hamburger bun and rolled a piece across the lawn to him. He immediately picked it up and started munching on a corner. Because of his condition he was not too afraid of me and I could get within a dozen feet before he would turn and move away. I was hoping a bit of food would help him survive until he found his mother. From the difficulty he was having it was obvious he was thirsty so I set out a dish of milk. Alternating between the bun and the milk he slowly did better then wandered off into the woods. I left the milk and in the morning it was all gone. The cub never returned and even though I later searched our woods I was unable to find any of the cubs or their mother, dead or alive. The experts tell you not to feed a bear cub regular milk as they cannot digest it and it makes them sick. Goats milk is recommended. Since I did not have goats milk and the cub was in serious condition I did my best. Had I gone for goats milk the cub would have been gone before I got back. As the days past following the bear cub visit we kept our eyes open in the hopes of seeing the mother and her cubs. I also contacted a few people but no one else saw the cubs again and no one ever saw a mother bear with cubs. I did what little I could, all the time making sure I did not get between a mother bear and her cub. Mother nature can be cruel and I doubt of this little guy survived. All we can do is appreciate his photos and hope he made it. 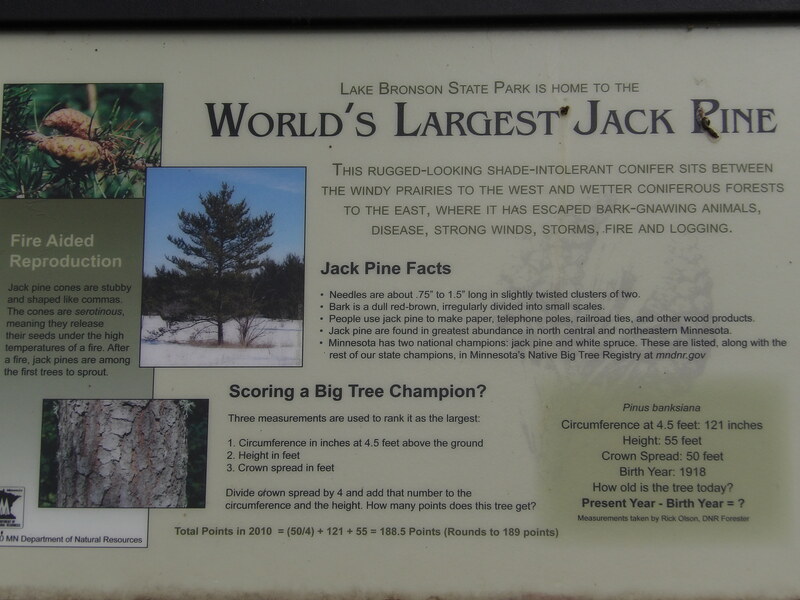 World’s largest Jack Pine – died! This photo was taken a week or so ago on the north side of the Two Rivers, on the east end of Lake Bronson state Park. Obviously the tree has died. 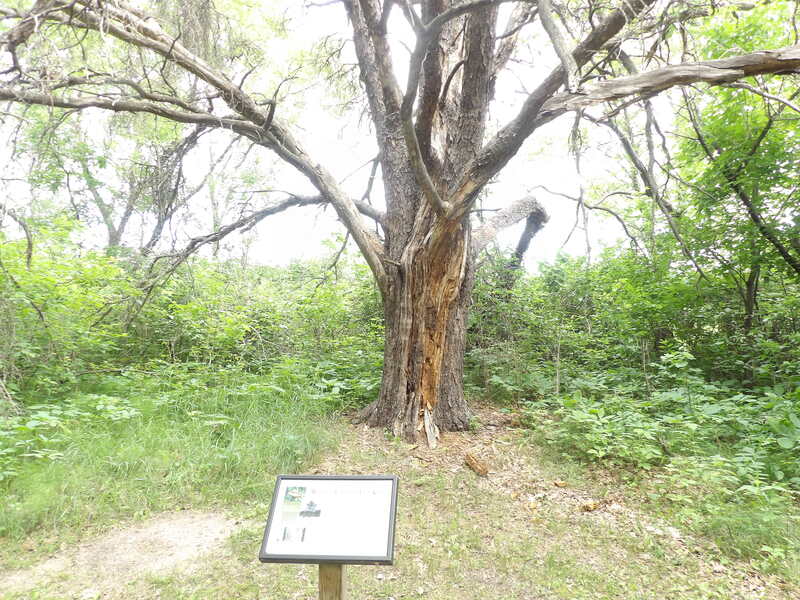 I saw this tree many years ago and was always amazed that the title included the words “Worlds Largest.” I did not doubt it was a large tree but found it hard to believe no one else had a larger one. Now that it has died I am interested in learning where and what tree now holds the new title. The tree is still standing but in sad shape and the next storm will no doubt knock it over. 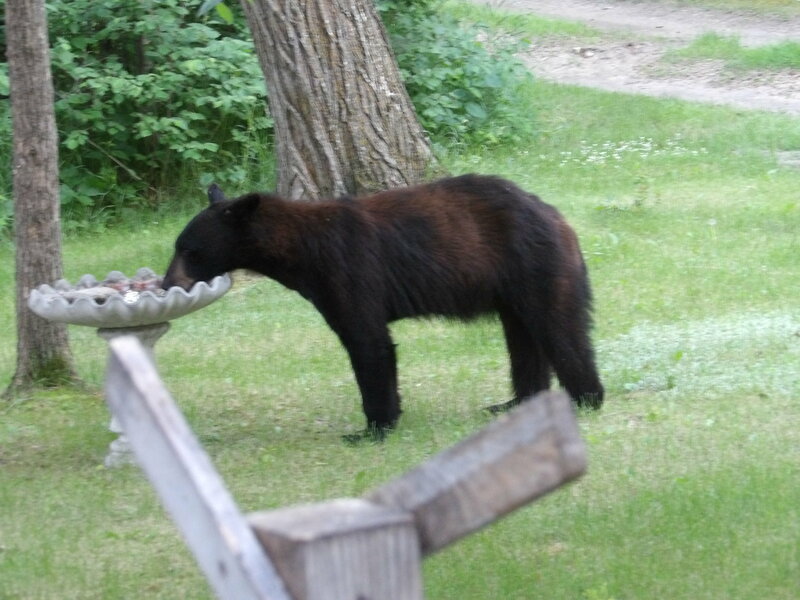 The day started out with my wife telling me we had a black bear at our feeder. I grabbed my camera and got a shot of the bear lying below the feeder and trying to extract suet from the suet holder. In order to get a better picture I stepped out side and the bear headed into our woods. I could see the suet holder still held plenty of suet left so I expected he would be back. Almost on que the bear came back, carefully sniffing the air and anxious to finish his snack. This gave me the chance to get a better photo, seen above. The bear looked about couple of years old and it was not too afraid of people. He slowly sauntered across the yard to my bird bath and had a long refreshing drink, at which time I got another photos. The bear payed no attention to me but was fully aware of my presence. He turned and strolled off into the woods but returned during the night to finish off the suet treat. While the coat was in good condition the bear looked a little thin and needed to pack on a lot more weight before he retired for the winter.